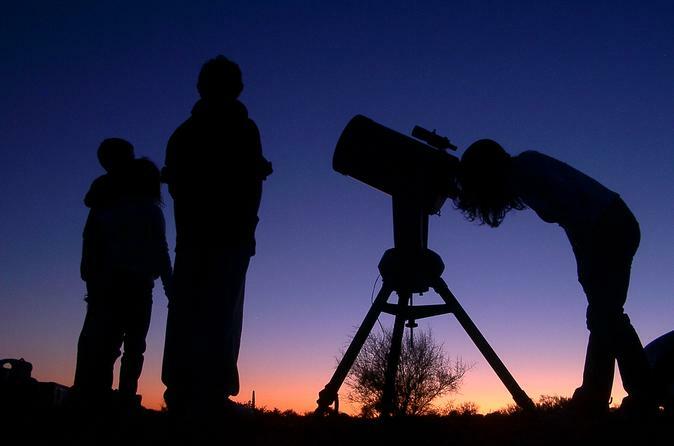 Head out of the city and into the clear desert night sky on this guided stargazing tour outside of Phoenix. Fix your gaze to the heavens as your look through a high-quality telescope with the help of a professional astronomer. Enjoy the stillness of the cool desert night as you search for wildlife with the help of night vision goggles and reflect without the noise of the busy city while standing underneath one of the clearest views of the Milky Way you can find in the Southwest. Few parts of the country offer as clear and pristine a view of the night sky than the desert back-country outside of Phoenix. What appears barren and inhospitable during a summer day comes alive at night as the temperatures drop and the sun drops below the horizon. On this special night vision and stargazing tour, you'll have the opportunity to view both the celestial and terrestrial with the help of custom-built goggles and a high-powered telescope. Your tour will start at 7:00 pm with a complimentary hotel pick-up from centrally located Phoenix hotels. As the rest of the city is heading to dinner and settling into the evening, your adventure is just beginning. Ride out in a 1 Hummer or Chevy M1009 Blazer out towards the desert to a specified location determined to give you the best view of the milky way and the highest chance to discover desert wildlife. Once you reach your destination, a professional astronomer will help set-up the telescope and guide you through the process of identifying the heavens and objects within your view. As temperatures continue to drop, your guide will outfit you with night vision goggles and help you scan the landscape as you search for deer, rabbits, owls, and coyote. Sit back and experience the quiet in a dark so black you might struggle to see your hand in front of you, then try on the goggles and watch the world around you come alive. Your guide will provide snacks and water throughout the experience along with all the equipment to ensure you enjoy yourself. The tour will conclude before 11:00 pm with a complimentary drop-off back at your hotel and a newfound appreciation of the complex desert ecosystem.